Director: Aleksandr Sokurov. Cast: Sergei Dreiden, Mikhail Piotrovsky, Mariya Kuznetsova, Aleksandr Chaban, Natalya Nikulenko, Maksim Sergeyev, Svetlana Smirnova, Artyov Strelnikov, Yuri Khomutyansky, Vladimir Baronov, Anna Aleksakhina, Yuli Zhurin, Leonid Mozgovoy, David Giorgiobaiani. Screenplay: Boris Khaimsky, Anatoli Nikiforov, Svetlana Proskurina, and Aleksandr Sokurov. I write this review having already placed Russian Ark at the top of my Ten Best list for 2002. As such, I feel a responsibility not merely to describe the film but to defend what always seems like an extravagant claim. Am I insisting that Russian Ark is the very greatest of all the pictures made in the last 12 months? Well, who could know. As gracious Oscar winners and sour festival losers are always reminding us, it is silly and counter-productive to put artworks in competition. Devising a Ten Best list, like assigning a "grade" to a movie, is a journalistic convention and a critical convenience, especially for readers who want a shorthand indication of what's "hot" and what's not. Putting any definitive or empirical pressure on these assessments is, as I'm sure is obvious, a totally subjective and probably unwise exercise. And yet, questions of "bestness" aside, I would certainly call Russian Ark the Movie Event of the Year, a dubious phrase that has recently connoted explosions, corporate hype, Big Mac tie-ins, and built-in sequel potential. Quite to the contrary, though, the glory of Russian Ark lies precisely in how it recaptures the idea of the cinematic Event as a distillation of those waning conceptsartistry, ambition, creativity, and ingenuity. (Remember them?) Even in an above-average year for movies, Lynne Ramsay's Morvern Callar was the only other film I saw in 2002 that prompted anything like the rush of new ideas, new aesthetic risks, and new marriages of form and emotion that Russian Ark conveys. Watching this movie gave me some sense of what moviegoing must have been like in the 1950s, when Cecil B. DeMille, Mike Todd, and other impresarios constantly pressed for new ways to make cinema an experiencewidening the screen, exponentiating the casts, and swelling the scope of what movies could show us. Perhaps, too, moviegoing in the first decades of the 20th century felt something like this, when every new picture was a sort of mad experiment. Back then, every new knob and lens and wheel added to the camera bore the voluptuous hint of unprecedented visions, or, at worst, the possiblity of fascinating new failures. Now, writer-director Aleksandr Sokurov, working at the outset of a different century and amidst grim prophecies of the cinema's demise, convinces us in one brilliant stroke that movies can still be revolutionary, and that they still have much to teach us. No verbal description could possibly convey (nor, happily, dilute) the film's unique sensory textures or temporal arrangements, which makes Sokurov's creation both a pleasure and a challenge to describe. Perhaps Russian Ark inspires such reveries because the film itself is structured as a sort of reverie. A narrator, whom we never see, opens the film over a black screen, with the odd benediction, "I open my eyes, and I see nothing." The first images are no less disorienting than the opening voiceover: giggling women and men dressed in fin-de-siècle finery whisk from a sidewalk into an underground corridor, only to emerge into the Hermitage Museum of St. Petersburg. The narrator, as confused as we are, tries to make sense of what he sees: "Judging by the clothes, this must be the 1800s. Where are they headed to?" It is not even clear whether he has traveled to the past or is watching a historical pageant mounted in his own era, for whatever unfathomable reason. "Has all this been staged for me?" he asks. "Am I expected to play a role? What kind of play is this? Let's hope it's not a tragedy." These questions are never firmly settled, and of course, the lack of resolution is the point. As it becomes clear what Russian Ark intends to show usnamely, a series of cryptic, ritualistic, visually stunning vignettes of Russian history, encountered in random order and without much narrative "context"the real import of the narrator's embarking questions also becomes clear. What is our relation to the past? How does one conceive of a nation's history: as a play, an exhibit, a dream, an archive, a nightmare? When the details and extenuating factors of daily life fall away, out of our collective memory, what survives for the eyes and minds of the future to see, to remember, to evaluate? Though he is manifestly an outsider, the Marquis' ambivalence sets a tone for the entire picture, which throbs, glitters, and aches throughout with the push-and-pull of extravagant dreams and sobering realities. With its 2,000-member cast, its lavish costumes and sets (including the standing collections of the Hermitage, constantly on display), three live orchestral performances, and a dazzling ballroom finale, Russian Ark could hardly be more plushly appointed. The dazed smiles of the courtiers and party-goers suggest that they can hardly believe their own good fortune at living in such a time, at hailing from such a bounteous nation. However, though the picture's cascade of historical episodes range across three centuries, from Medieval lore to ghastly forebodings of Stalinist terror, the framing scenes all poignantly derive from the very eve of Bolshevism. At the climax, Nicholas II holds one last masque and mazurka for a noble class that, within weeks, will be as antiquated as the museum pieces. Sokurov can hardly be accused of simple nostalgia. Too many elements of the film, from the frightful interlude in a coffin-maker's cabinet to the ghostly narrating voice and the gelid final shot, cast a powerful pall on the whole enterprise. The movie opens and closes in the dark, a Stygian gloom that punctures the heart of the film every now and then, sharply delimiting the pleasure-dome of the Hermitage and reminding us of the chill outside. Watching even the giddiest scenes is like watching the flashback inserts in the underwater prologue of James Cameron's Titanic; it is not just affluence we are cued to perceive, but the unimaginable ignorance of those about to die, spectacularly. The looming evanescence, as again in Titanic, is as fascinating to the film as the ornateness itself. Sokurov's is the eye of a connoisseur of crypts, a photographer of the dead. "Let's hope it's not a tragedy," our narrator has intoned at the film's beginningbut we already know it is, or was, or will be a tragedy. Soon enough, there will be bodies ("Don't walk on the corpses!" shouts the coffin-maker) and misery and silence. Russia, even at its imperial apogee, emerges here as a mirage, a fabulous improbability sustained for a time by the libido and munificence of an elite class, by a denial of offstage suffering and imminent mortality, and by foreign onlookers like the Marquis who watch the nation in wonder. 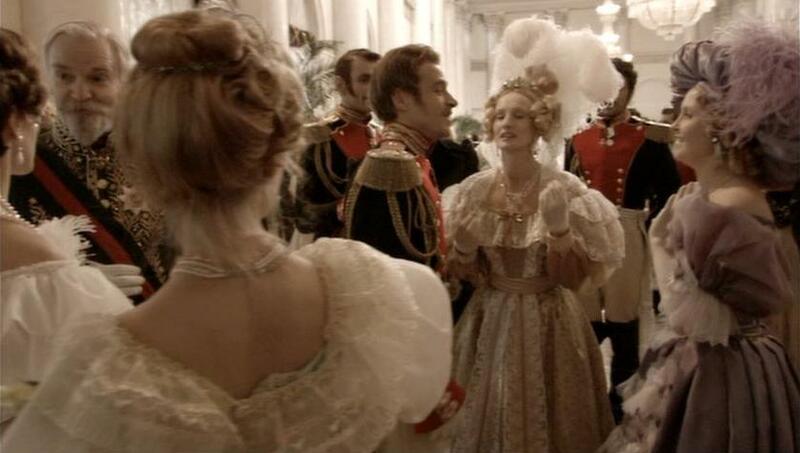 This is why Russian Ark loses little to none of its impact for those viewers (like me) who know little or nothing of the "true" events it revives. What the film taps into, even to the historically uninitiated, is the contradictory grandness that has always emblematized Russia for the rest of the world, a land that made a dynasty of paradox: huge but unevenly inhabited, luxuriant but unevenly apportioned, European but Asian, the superpower that crumbled, this array of warring principalities absorbed by will and desire into something called a "country." And still I have said nothing of the film's driving conceit, its notorious visual and technical coup: the entire 96 minutes transpires without a single cut, just one long, continuous, perpetually moving shot, threading constantly between rooms, orbiting around ceremonies, tracking over orchestra pits while the musicians play, wheeling around corners and around dancers, racing after sprinting children and sprinting empresses, entering and exiting the premises. In terms of filmmaking, Russian Ark is beyond experimental; it is literally groundbreaking. A new camera had to be invented that could record 90 minutes of images, recording them to a tailor-made hard drive, operated directly and in real time by a German cinematographer who speaks no Russian, commandeered and choreographed by a Russian director who speaks no German. A translator shuttled between the two men throughout the two midwinter afternoons (only four hours apiece) that the Hermitage was willing to close for on-set rehearsals, light-rigging, and filming. The logistics are mind-boggling, and indeed, they seem to have boggled some of the finest minds in film criticism. The Cannes Festival jury in 2002, when Russian Ark screened in competition, unbelievably elected not to bestow the annual Technical Prize on any eligible contender. Among professional reviewers, Stanley Kauffman for one has publicly groused that Russian Ark is really only a highbrow gimmick, its characters and action too stagnant and culturally remote to propel any movie that weren't selling itself as a curio. And though the film has been a surprise arthouse hit in America, some audience members have complained of the tedium that eventually sets in as the invisible narrator moves, often uncomprehendingly, from room to room. In response to these detractions, I would argue with confidence that the conceptual brio of Russian Ark is not some gratuitous stunt divorceable from the film's "content," much less a compensatory crutch for a paucity of story. It seems evident to me that a precise philosophy and poetics of national history are encoded in the movie being shaped precisely this way: as a massive object that bewilders the casual observer, an inseparable braid of illegible rites and more identifiable landmarks, a timeframe punctuated by key figures and occurrences but undergirded always by the slow, tectonic motion of the world. Remember, too, what a specific act of rebellion Sokurov's movie implies in the context of Russian moviemaking. Eisenstein and Dovzhenko, deliberately seeking to inaugurate a historically conscious Russian cinema in the 1920s and 1930s, premised their entire craft on the force of montage. Cutting emphatically between a battleship and a crowd, a peasant and a field, a human march and a machine, was the tool on which the fathers of Soviet cinema founded not just their art but their politics. The drive of these films, though it may cramp contemporary sensibilities, is to make it virtually impossible to neglect their messages, to deny their protestful cries. Now comes Russian Ark, which does not abandon the dialectic notion of history but embeds it in a lifelike circumstance of total inseparability. The same asymmetries, the same relations and paradoxes of power that ignite a film like Potemkin are alive in Russian Ark, but garbed in the imperial lusciousness that gave them their power to begin with. It is hard to watch Potemkin or October and not ask, who allowed the world to degenerate in this way? Russian Ark perplexes in a different way. Who would be immune to these seductions, we inquire, as the mazurka swells through the Great Nicholas Hallbut who could doubt that they would wither, or be subject to siege? In this way, Sokurov might be credited with making, of all things, a melodrama. Russian Ark yields hours of visual astonishment that in turn yield days, weeks, of intellectual provocation. It is an unbeatable combination, and probably unrepeatable, leading Film Comment to whine in its year-end issue that Sokurov's feat is a cinematic cul-de-sac, promising much but leading nowhere. Set aside the fact that Russian Ark, as perfectly befits its themes, has placed even this putative detractor in touch with the profound sense of melancholy that is the film's own pulse. Rather than impugn Sokurov, then, why not save our complaints for those filmmakers and filmmaking traditions that would never have made such a gamble? American Ark, for one, is impossible to imagine, partially for practical reasons (where would it ever be set? ), but primarily for those of temperament. What American artist would be brave enough to pay such complex tribute to the beleaguered, divided legacies of our nation? What American institution would be courageous enough to fund it? What American audience would conceivably pay to see it?